You know that the use of Google Webmaster Tools is effective in setting different parameters for analyzing the impact of your website or blog on search engines and making it user-friendly for your blog. I emphasize a lot about how Webmaster uses tools and how it helps to increase the speed of indexing. The problem is that many bloggers are usually found in Webmaster Tools, there are 404 broken link errors that you can easily improve by reading this complete guide in the link and other errors in the HTML Fix section. I have discussed this guide broadly and on various things to fix it. How this is Generated ?. why are duplicate meta descriptions bad? 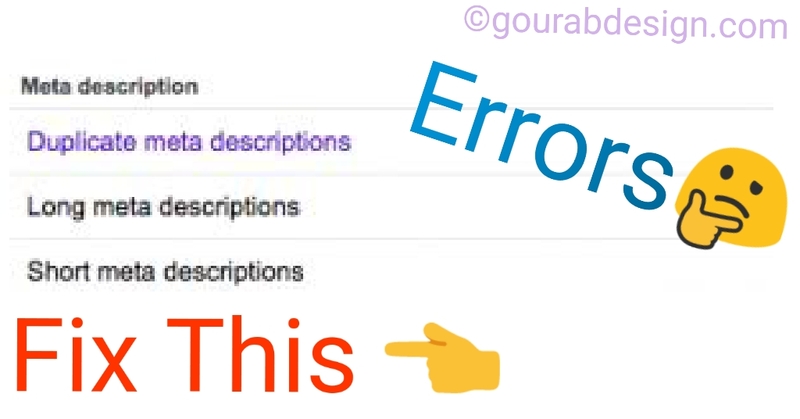 In fact, meta-description errors are usually displayed in the Advanced Webmaster HTML Tools section for blog users because if they use meta descriptions for their posts, they should be easily enabled using your web settings. Blogger settings Here are some common reasons why you're going to duplicate meta description errors in webmaster tools. You have not provided any details about an article on Blogger, and it contains everything due to duplication issues. Generally, the description can be helpful in SEO perspective, but not too much, but you should consider it as the lines telling your readers. Another reason for common bloggers problems is that tags and archives can be used due to duplication issues. So, if you have not tagged your archive and tagged your page as an index, you would definitely show the bomber to duplicate the meta description in your webmaster tool. >>You can block Google robots such as archive pages and other search pages with an integrated blogger option, such as a "custom robot" tag, here's a simple step. Open the "Special Robot Header Tag" section and mark each item shown in the screenshot. Save and your duplicate meta-meta problems will no longer be present on your Blogger blog. This step is the easiest and fastest. > Visit your dashboard > > layout >> Edit html >> click it. It will be disabled beforehand. Enable it. See empty box will open. Paste the full tag below into it. Just done all your work. Now there is no need to worry. And do not worry if you live in my life. After becoming a website, many problems arise. But you will not be able to take your site any further if you are afraid of it right now.So do not ever let the rate come close. Whatever the issue, fix it. So that your site could rank. Since I have created this website, there has been a lot of trouble since then. But I never considered defeat. Face it.That's why I would like to say to all of you that if you want to be succesful like me then always take care of your blog. Otherwise, you will be left behind. Love of Childhood and Love of College - Which of these two should I choose? If you like this post, please share it with me in social media. So that everyone can benefit.If you have any questions in mind then definitely have a comment..